James Zadroga was a New York City Police Officer, who died on Jan. 5, 2006, due to a respiratory disease that’s been linked to his three weeks working the rescue and recovery efforts at the former World Trade Center site. 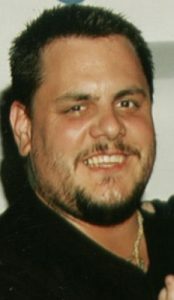 Zadroga’s death was the first official death associated with the 9/11 toxins in the air after the attacks at the World Trade Center. The James Zadroga 9/11 Health and Compensation Act of 2010 and the reauthorization provides health care coverage through the World Trade Center Health Program (WTCHP) and compensation through the September 11th Victim Compensation Fund (VCF) to 9/11 responders and survivors. 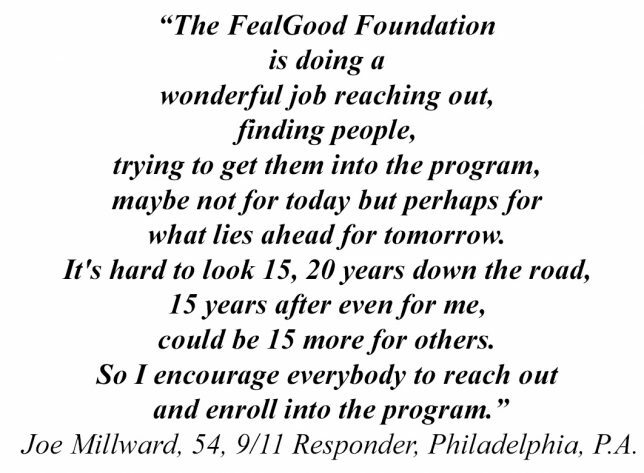 The WTCHP provides health care for responders and survivors who were physically and mentally affected by the Sept. 11, 2001, attacks in New York, Washington D.C. and Pennsylvania. The WTCHP began enrolling Pentagon and Shanksville, Pennsylvania, responders on May 1, 2013. The WTCHP is administered by National Institute for Occupational Safety and Health (NIOSH), which is responsible for researching and developing health and safety standards for the prevention of work-related injuries and illnesses. As defined by the WTCHP, a responder is a worker or volunteer who provided rescue, recovery, demolition, debris removal and other services because of the Sept. 11, 2001, attacks. The FDNY are a separate group of responders. As defined by the WTCHP, a survivor is a person who lived, worked, attended school, childcare or adult day care in the New York City disaster area on Sept. 11, 2001, or in the following months. 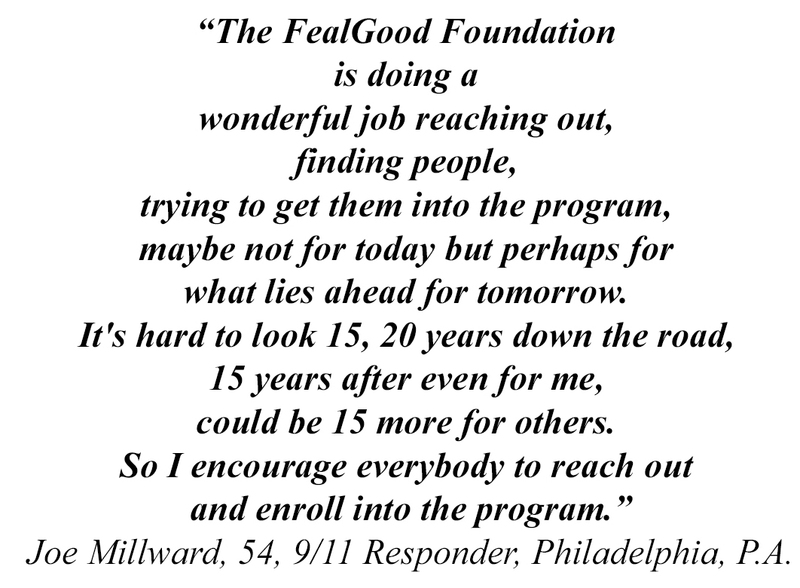 The WTCHP opened on July 1, 2011, grandfathering in 60,984 members from other programs, Feal being one of them. Currently there are 75,016 members in the WTCHP from every state including the D.C. The map below shows how many responders and survivors of the WTCHP there are by state and other territories are listed beneath the map. to protect confidentiality of at least one (1) but fewer than ten (10) members. assign to a state are reported in the “Unknown” category. The WTCHP provides health care through two care networks—Clinical Centers of Excellence (CCE) and Nationwide Provider Network (NPN). CCE’s are located in New York City and offer care to WTC responders and survivors. NPN‘s provides services for members who live outside of New York or if a WTC responder or survivor moves outside of the state. The WTCHP works with members existing insurances as well. The Zadroga Act was part of the omnibus, $1.1 trillion 2016 federal spending bill that will allocate $8.1 billion to fund the WTCHP and VCF. The reauthorization extended the VCF for another five years at $4.6 billion. The WTCHP will receive $3.5 billion. The House approved the bill by a 313-113 vote and by a 65-33 vote in the Senate. “They have health care and that’s the most important,” says John Feal. The VCF was created after Sept. 11, 2001, and provides financial compensation for an individual [or their estate] who experienced physical harm or was killed due to the attacks, the rescue, the recovery, or cleanup efforts in the months following Sept. 11, 2001. The VCF now compensates those who are suffering from illnesses stemming from 9/11 or lost wages. The VCF is administered by the United States Department of Justice. Special Master of the VCF Sheila Birnbaum announced that paying Group A claims is the organization’s main objective and hopes to finish distributing money by June. Group A claims are valued at $716 million. Group B payments are slated to begin in September. Some are still eligible to file a claim. The timeline below shows an outline of claims in process, received and payments made to Group A and a schedule for Group B payments. 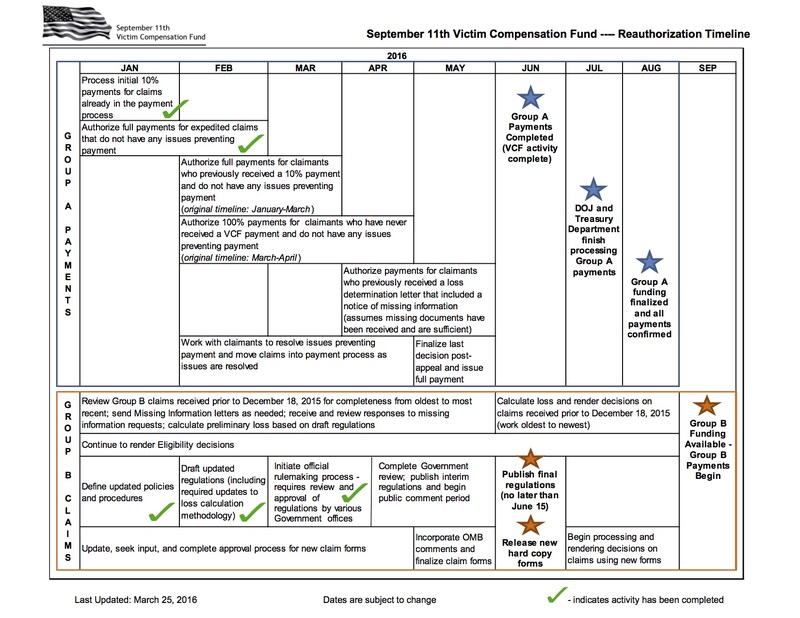 This reauthorization timeline shows the VCF’s 2016 outline of claims processed, received and payments made to Group A and a schedule for Group B payments. Source: September 11th Victim Compensation Fund.